The House of Commons says it will look again at the length of time Big Ben will be silenced during renovation work after "concerns". The bell is to be put out of use - except for special occasions - for four years on Monday to allow repairs to the surrounding Elizabeth Tower. Parliament said it had to protect workers carrying out the renovations. But Prime Minister Theresa May said "it can't be right" that the famous bongs will not be heard again until 2021. How do you take a good photo of Big Ben? She said Speaker John Bercow should "urgently" review the proposals. Now, in a statement, the House of Commons has said: "When Parliament returns, in light of concerns expressed by a number of MPs, the House of Commons Commission will consider the length of time that the bells will fall silent. "Of course, any discussion will focus on undertaking the work efficiently, protecting the health and safety of those involved, and seeking to ensure resumption of normal service as soon as is practicable given those requirements." A Commons spokesman said the bells would cease to ring on Monday, following the chimes at noon, as planned. But he added: "Big Ben's bongs are an integral part of parliamentary life and we will ensure that they can resume their role as the nation's timekeeper as soon as possible." Asked about the plan to silence the bells for four years - which has been strongly criticised in some sections of the press - Mrs May said: "Of course we want to ensure people's safety at work but it can't be right for Big Ben to be silent for four years. "And I hope that the Speaker, as the chairman of the House of Commons Commission, will look into this urgently so that we can ensure that we can continue to hear Big Ben through those four years." Labour leader Jeremy Corbyn said he would miss the sound of Big Ben, but that the welfare of people working alongside it should come first. He added: "So if we have to miss Big Ben in reality for a while so that work can be done, well, that's something we have to go through. "It's not a national disaster or catastrophe." A Commons spokesman said "starting and stopping Big Ben is a complex and lengthy process" and it would not be possible to continue ringing the bells for the entire period. He added: "The whole process takes around half a day to complete. "Following a thorough assessment, experts have concluded that it would not be practical or a good use of public money to start and stop the bells each day, particularly as we cannot fully predict the times that staff will be working on this project." 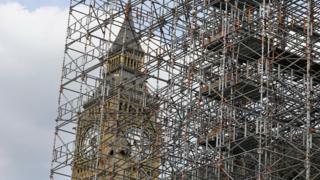 The Commons Commission is responsible for maintenance of the Palace of Westminster. Lib Dem MP Tom Brake, a member of the commission, has written to the Commons director general to ask about the cost and practicality of "ringing them more frequently" during the repair works. He said: "It would not be possible for them to continue to be rung every 15 minutes as is currently the case, that would not be practical, but it may be perhaps practical and it may be financially viable to ring them more frequently than is currently being proposed." The £29m restoration was signed off in 2015 by the Commons Administration Committee, which advises the commission, as well as the Lords Administration and Works Committee and the Commons Finance Committee. But Mr Brake said MPs did not know the full extent of the shutdown when they agreed the repair plans. Last year the House of Commons said the bells would have to be switched off for "several months" to allow the repair work to take place. On Monday, it was revealed this would involve a much longer period of silence, with the bells only being switched back on for important events like New Year and Remembrance Sunday. This led to press criticism, and Brexit Secretary David Davis described the move as "mad". Defending itself, Parliament said that "prolonged exposure to the chimes would pose a serious risk to the hearing" of those working on the project.